Coordinated Universal Time (French: Temps universel coordonné), abbreviated as UTC, is the primary time standard by which the world regulates clocks and time. It is, within about 1 second, mean solar time at 0° longitude; it does not observe daylight saving time. It is one of several closely related successors to Greenwich Mean Time (GMT). For most purposes, UTC is considered interchangeable with GMT, but GMT is no longer precisely defined by the scientific community. The current version of UTC is defined by International Telecommunications Union Recommendation (ITU-R TF.460-6), Standard-frequency and time-signal emissions and is based on International Atomic Time (TAI) with leap seconds added at irregular intervals to compensate for the slowing of Earth's rotation. Leap seconds are inserted as necessary to keep UTC within 0.9 seconds of universal time, UT1. See the "Current number of leap seconds" section for the number of leap seconds inserted to date. unofficial French: "Universel temps coordonné"
The westernmost time zone uses UTC−12, being twelve hours behind UTC; the easternmost time zone, theoretically, uses UTC+12, being twelve hours ahead of UTC. In 1995, the island nation of Kiribati moved those of its atolls in the Line Islands from UTC-10 to UTC+14 so that the country would all be on the same day. UTC is used in many internet and World Wide Web standards. The Network Time Protocol, designed to synchronise the clocks of computers over the internet, encodes times using the UTC system. Computer servers, online services and other entities that rely on having a universally accepted time use UTC as it is more specific than GMT. If only limited precision is needed, clients can obtain the current UTC from a number of official internet UTC servers. For sub-microsecond precision, clients can obtain the time from satellite signals. UTC is also the time standard used in aviation, e.g., for flight plans and air traffic control clearances. Weather forecasts and maps all use UTC to avoid confusion about time zones and daylight saving time. The International Space Station also uses UTC as a time standard. Amateur radio operators often schedule their radio contacts in UTC, because transmissions on some frequencies can be picked up by many time zones. Since 1972, UTC is calculated by subtracting the accumulated leap seconds from International Atomic Time (TAI), which is a coordinate time scale tracking notional proper time on the rotating surface of the Earth (the geoid). 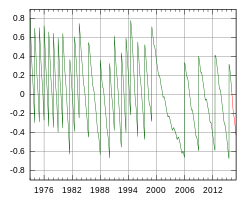 In order to maintain a close approximation to UT1 (equivalent to GMT), UTC occasionally has discontinuities where it changes from one linear function of TAI to another. These discontinuities take the form of leap seconds implemented by a UTC day of irregular length. Discontinuities in UTC have occurred only at the end of June or December, although there is provision for them to happen at the end of March and September as well as a second preference. The International Earth Rotation and Reference Systems Service (IERS) tracks and publishes the difference between UTC and Universal Time, DUT1 = UT1 – UTC, and introduces discontinuities into UTC to keep DUT1 in the interval (−0.9 s, +0.9 s). It is not possible to compute the exact time interval elapsed between two UTC timestamps without consulting a table that describes how many leap seconds occurred during that interval. By extension, it is not possible to compute the duration of a time interval that ends in the future and may encompass an unknown number of leap seconds (for example, the number of TAI seconds between 'now' and 2099-12-31 23:59:59). Therefore, many scientific applications that require precise measurement of long (multi-year) intervals use TAI instead. TAI is also commonly used by systems that cannot handle leap seconds. GPS time always remains exactly 19 seconds behind TAI (neither system is affected by the leap seconds introduced in UTC). For most common and legal-trade purposes, the fractional second difference between UTC and UT (GMT) is inconsequentially small. Greenwich Mean Time is the legal standard in Britain during the winter, and this notation is familiar to and used by the population. Time zones are usually defined as differing from UTC by an integer number of hours, although the laws of each jurisdiction would have to be consulted if sub-second accuracy was required. Several jurisdictions have established time zones that differ by an integer number of half-hours or quarter-hours from UT1 or UTC. The time zone using UTC is sometimes denoted UTC±00:00 or by the letter Z — a reference to the equivalent nautical time zone (GMT), which has been denoted by a Z since about 1950. Time zones were identified by successive letters of the alphabet and the Greenwich time zone was marked by a Z as it was the point of origin. The letter also refers to the "zone description" of zero hours, which has been used since 1920 (see time zone history). Since the NATO phonetic alphabet word for Z is "Zulu", UTC is sometimes known as "Zulu time". This is especially true in aviation, where "Zulu" is the universal standard. This ensures all pilots regardless of location are using the same 24-hour clock, thus avoiding confusion when flying between time zones. See the list of military time zones for letters used in addition to Z in qualifying time zones other than Greenwich. In 1960, the ephemeris second was defined as In 1958, data was published linking the frequency for the caesium transition, newly established, with the ephemeris second. The ephemeris second is the duration of time that, when used as the independent variable in the laws of motion that govern the movement of the planets and moons in the solar system, causes the laws of motion to accurately predict the observed positions of solar system bodies. Within the limits of observing accuracy, ephemeris seconds are of constant length, as are atomic seconds. This publication allowed a value to be chosen for the length of the atomic second that would work properly with the celestial laws of motion. In 1961, the Bureau International de l'Heure began coordinating the UTC process internationally (but the name Coordinated Universal Time was not adopted by the International Astronomical Union until 1967). Time steps occurred every few months thereafter, and frequency changes at the end of each year. The jumps increased in size to 100 ms. This UTC was intended to permit a very close approximation to UT2. The first leap second occurred on 30 June 1972. Since then, leap seconds have occurred on average about once every 19 months, always on 30 June or 31 December. As of July 2015, there have been 26 leap seconds in total, all positive, putting UTC 36 seconds behind TAI. As the Earth's rotation continues to slow, positive leap seconds will be required more frequently. The long-term rate of change of LOD is approximately +1.7 ms per century. At the end of the 21st century, LOD will be roughly 86,400.004 s, requiring leap seconds every 250 days. Over several centuries, the frequency of leap seconds will become problematic. Some time in the 22nd century, two leap seconds will be required every year. The current use of only the leap second opportunities in June and December will be insufficient, and the March and September options will have to be used. In the 25th century, four leap seconds will be required every year, so the current quarterly options will be insufficient. Thereafter there will need to be the possibility of leap seconds at the end of any month. In about two thousand years, even that will be insufficient, and there will have to be leap seconds that are not at the end of a month. In a few tens of thousands of years (the timing is uncertain), LOD will exceed 86,401 s, causing UTC to require more than one leap second per day. ITU‑R Study Group 7 and Working Party 7A were unable to reach consensus on whether to advance the proposal to the 2012 Radiocommunications Assembly; the chairman of Study Group 7 elected to advance the question to the 2012 Radiocommunications Assembly (20 January 2012), but consideration of the proposal was postponed by the ITU until the World Radio Conference in 2015, convening on 2 November. The possibility of suppressing the leap second was considered in November 2015 at the World Radiocommunication Conference (WRC-15), which is the international regulatory body which defines Coordinated Universal Time. No decision to suppress leap seconds was reached; the issue will be studied further and reconsidered in 2023. ^ BelleSerene. "French time: "heure légale"". Yachting and Boating World Forums. Retrieved 5 August 2011. ^ Rob Seaman (9 Apr 2001). "Upgrade, don't degrade". Archived from the original on 2 June 2013. Retrieved 2015-09-10. ^ "ITU World Radiocommunication Conference set for Geneva, 2-27 November 2015". International Telecommunications Union. 2015. Retrieved November 3, 2015. ^ "Coordinated Universal Time (UTC) to retain 'leap second'". International Telecommunications Union. 2015-11-19. Retrieved November 19, 2015. "Bulletin C". International Earth Rotation and Reference Systems Service. 16 January 2014. Essen, L. (1968). "Time Scales" (PDF). Metrologica 4 (4): 161–5. Bibcode:1968Metro...4..161E. doi:10.1088/0026-1394/4/4/003. Retrieved 18 October 2008. Finkleman, David; Allen, Steve; Seago, John; Seaman, Rob; Seidelmann, P. Kenneth (2011). "The Future of Time: UTC and the Leap Second". American Scientist 99 (July–August 2011): 312. arXiv:1106.3141v1. doi:10.1511/2011.91.1. Guinot, Bernard (August 2011). "Solar time, legal time, time in use". Metrologica 48 (4): S181–185. Bibcode:2011Metro..48S.181G. doi:10.1088/0026-1394/48/4/S08. "History of TAI-UTC". Time Service Dept., U.S. Naval Observatory. c. 2009. Retrieved 4 January 2009. ITU Radiocommunication Assembly (2002). "Standard-frequency and time-signal emissions" (PDF). International Telecommunications Union. Retrieved 2 August 2011. McCarthy, Dennis D. (July 1991). "Astronomical Time" (PDF). Proc. IEEE 79 (7): 915–920. doi:10.1109/5.84967. Markowitz, W.; Hall, R.; Essen, L.; Parry, J. (August 1958). "Frequency of caesium in terms of Ephemeris Time" (PDF). Physical Review Letters 1 (3): 105–7. Bibcode:1958PhRvL...1..105M. doi:10.1103/PhysRevLett.1.105. Retrieved 18 October 2008. Markowitz, Wm. (1988). "Comparisons of ET (Solar), ET (Lunar), UT and TDT". In Babcock, A. K.; Wilkins, G. A. The Earth's Rotation and Reference Frames for Geodesy and Geophysics: Proceedings of the 128th Symposium of the International Astronomical Union, held in Coolfont, West Virginia, U.S.A., 20–24 October 1986. Dordrecht: Kluwer Academic Publishers. pp. 413–418. Bibcode:1988IAUS..128..413M. National Institute of Standards and Technology (18 January 2011). "Frequently asked questions (FAQ)". Retrieved 17 July 2011. Nelson, G.K.; Lombardi, M.A. ; Okayama, D.T. (2005). "NIST Time and Frequency Radio Stations: WWV, WWVH, and WWVB" (PDF). National Institute of Standards and Technology. (Special Publication 250-67). Archived (PDF) from the original on 26 June 2008. Nelson, Robert A.; McCarthy, Dennis D. (13 September 2005). Coordinated Universal Time (UTC) and the Future of the Leap Second. Civil GPS Interface Committee. United States Coast Guard. Archived from the original on 29 April 2011. Nelson, Robert A.; McCarthy, Dennis D.; Malys, S.; Levine, J.; Guinot, B.; Fliegel, H. F.; Beard, R. L.; Bartholomew, T. R. (2001). "The leap second: its history and possible future" (PDF). Metrologia 38 (6): 509–529. Bibcode:2001Metro..38..509N. doi:10.1088/0026-1394/38/6/6. Seidelmann, P. Kenneth; Seago, John H. (August 2011). "Time scales, their users, and leap seconds". Metrologia 48 (4): S186–S194. Bibcode:2011Metro..48S.186S. doi:10.1088/0026-1394/48/4/S09. Stephenson, F. R.; Morrison, L. V. (1995). "Long-term fluctuations in the Earth's rotation: 700 BC to AD 1990". Philosophical Transactions of the Royal Society A 351 (1695): 165–202. Bibcode:1995RSPTA.351..165S. doi:10.1098/rsta.1995.0028. Williams, Jack (17 May 2005). "Understanding and using Zulu time". USA Today. Retrieved 25 February 2007. This page was last modified on 27 June 2016, at 15:04.